Some years ago, the Temple David Trust put in place a strategy to ensure the long term sustainability of Bet David. Part of this strategy was the enhancement of property rights and the development of a new well planned Bet David Campus. 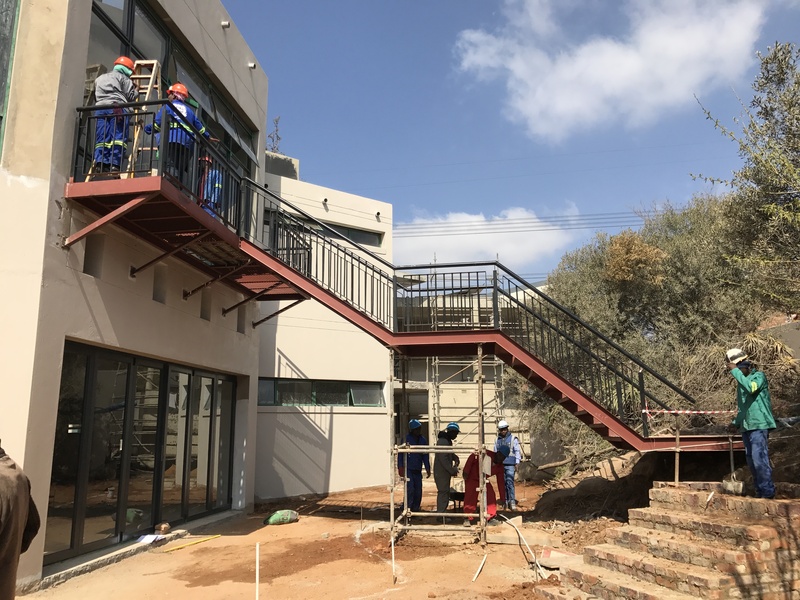 The implementation of this strategy has included the design of a new Nursery School, Mitzvah School, Religion School, Offices for Netzer, SAUPJ and Kehillah and a new Synagogue, boardroom, offices and related facilities above the existing Middleton hall. You will find below regular updates about the building process and the current status of the development. Non of this will be possible without support of our members and friends. Your contribution as a “Founding Contributor” could be an important part of this amazin project and will be greatly appreciated. It will be a tangible sign of your commitment to the future of Progressive Judaism in Sandton. Founding contributors will receive a certificate in their name, or in a name nominated by them or be inscribed on a Founding Contributors Board in the Shul or, where possible, have their name and date on a plaque on the item for which a contribution was made, as indicated below. If you would like to contribute, please contact the office. Since the last report, many facets of the new campus have been completed. The traffic lights at the intersection of South and Middle Roads are now working and the entrance to Bet David is paved. The booms are operational and the security cameras have been installed. The pumps for the underground water tanks are being commissioned and the garden taps are in place. This is very helpful as the landscaping has begun, with the moving of shrubs and large trees from the plant protection zone to their final positions. Planting is being done in the planter box along the western boundary wall, to form a screen eventually between Bet David and the adjacent development. The existing large trees close to Zone C have been professionally trimmed and the oak trees have been sprayed for sooty mould. One of the major features of the new building, the large East facing window, is being placed and the main staircase is being erected. 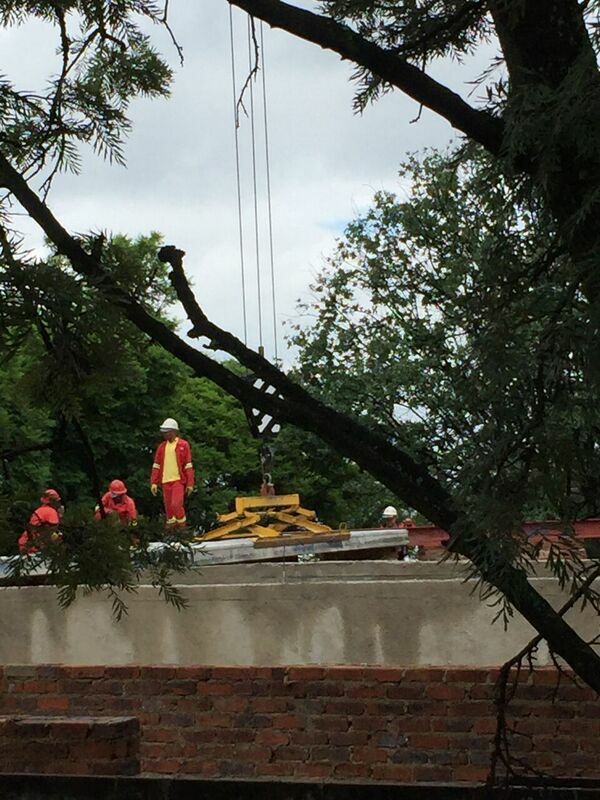 The lift, which was manufactured in Sweden and shipped to Durban, was due to be installed last Friday but was irreparably damaged in a truck accident en route from Durban to Bet David. A replacement lift is urgently being manufactured and will be airfreighted to Johannesburg in October. The lift company is arranging a temporary replacement to be operational during the High Holy Days. The synagogue seats are presently being installed and the construction of the Bimah and the Ark is nearing completion. The fitting of the full catering kitchen in The Middleton is complete and a lease is being finalized with a tenant. There is still much activity on site, as all the final finishes are all being completed simultaneously. As we move towards the exciting last phase of the construction, all the final major elements are being installed. The woodwork on the Bimah is progressing well. The external staircases, one of which is a spiral, are being completed. All the window and doors are currently being installed, ensuring that we have an enclosed area in which to work on those finishes and items that need to be protected from the elements. The Koi Pond, featuring a waterfall and rockery, as well as the western planter boxes will be completed within the next ten days. (See photo.) The moving of trees into their final positions and the paving of the open areas and paths will commence at the end of August. The steel structure for the roof, which was being installed at the time of the last update, has been completed and the cladding of the roof is well underway (Pictured below left). The area to be covered with clip lock sheeting is finished, as is the section to be covered with Sanika waterproofing. The last phase of the roof covering, which is the cladding of the prisms, has commenced and is proceeding well. The next and final phase of the roof is the installation of the skylights. The aluminium door and window frames for the Rabbi’s new office and the administration area have all been installed. The new sanctuary is feeling more and more like a sacred place, with the completion of the brick work for the new Aron Kodesh and the recesses for the stained glass Ten Commandments from our old sanctuary. Construction of the new koi pond began this week, thanks to the generous donation from Robert Capper, for which we are most grateful. The koi pond will become an integral part of the landscaped garden setting of the new Shul (pictured right). The well landscaped and treed garden will be a very important part of our new campus, creating a serene and beautiful environment and encouraging birds and insects. The aloes we have moved will attract birds and the drought resistant, evergreen Buddleja Saligna trees that will be planted to screen the development to the west, are particularly good at attracting birds, bees and butterflies. 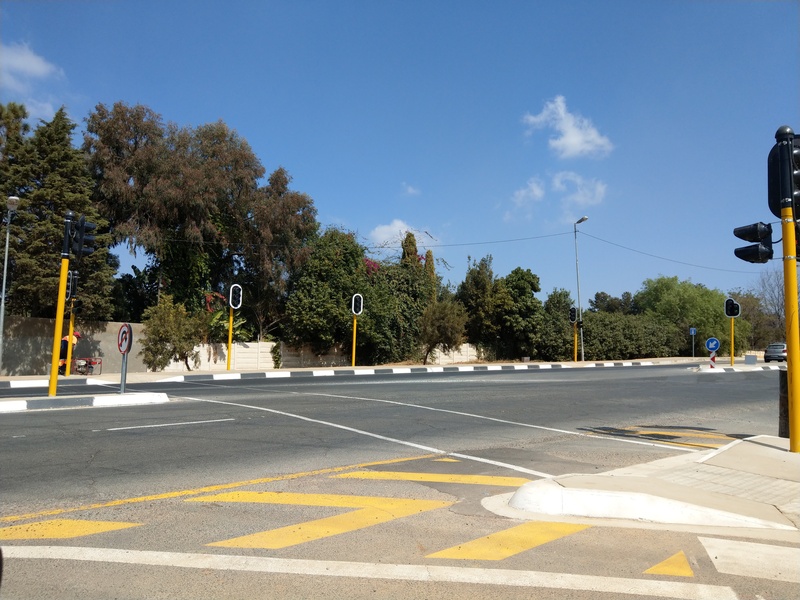 The intersection of Middle and South Road is complete, except for the installation of the traffic lights by the Johannesburg Roads Agency (JRA). This process is out of our hands. The payment for the electrical supply for the traffic signals has been made to the JRA, which needs to pay Eskom to install the supply. The JRA has measured for the signals but their payment system is currently “closed” for their year end. Once payment is made and Eskom installs the electrical supply, work on the signals can commence. We have reached the exciting stage where the steel roof structure for the new shul is currently being erected. This is one of the critical milestones in the construction process. The roof of the main synagogue has 8 tent shaped prisms, off a main gallery with skylights, to ensure light and air. (See aerial photograph.) The floor tiles have been laid in the revamped Middleton Hall and the new, extended catering kitchen is being fitted. The revamping of the hebrew lettering, the stained glass Ten Commandments and two large menorah lights from our old synagogue will commence shortly for placement in the new synagogue. Landscaping detail, incorporating a new koi pond, is currently being finalized. During the next two weeks, the piping connecting our borehole to the new underground water tanks will be completed. The construction and installation of the external services are progressing well. The sewer line into which the Campus needs to connect is on the other side of the river one which crosses heading south along South Road. Our contractors have completed the sewer line crossing over the river and the construction of the sewer line from the other side of the river to site. The storm water attenuation pond on site is 90% complete. When it does not have water in it, this attenuation pond is planned as a basketball practice area for the Mitzvah School pupils. The street lights along Middle Road have been moved to their final position by City Power and the eastern side of the road has been widened. We have paid Eskom the amount they required to move their cables on the western side of the road and have been waiting some time for them to do this. Eskom has indicated that their cables should be moved within the next 5 weeks. We are also waiting for MTN to move their fibre cables to enable us to commence with the left-in turning lanes on the western side of Middle Road. The box cuts for the intersection of Middle and South Roads are complete and quotes are being obtained for the traffic lights to be installed on the corner of Middle and South Roads. Negotiations are being finalised with a steel fabricator to construct the steel structure for our beautifully designed roof structure for the Synagogue at the appropriate price. The roof covers the main gallery, running the width of the building off which the sanctuary and the offices are accessed. The roof over the sanctuary incorporates 8 pyramid-shaped structures that provide natural lighting and air ventilation through the sanctuary. Desmond Sweke. Each update from now will focus on a different aspect of the development. This week’s focus is the road upgrades. The upgrading of Middle Road and the South Road intersection are underway. The intersection upgrading incudes a traffic light. The widening on the eastern side of Middle Road is complete. 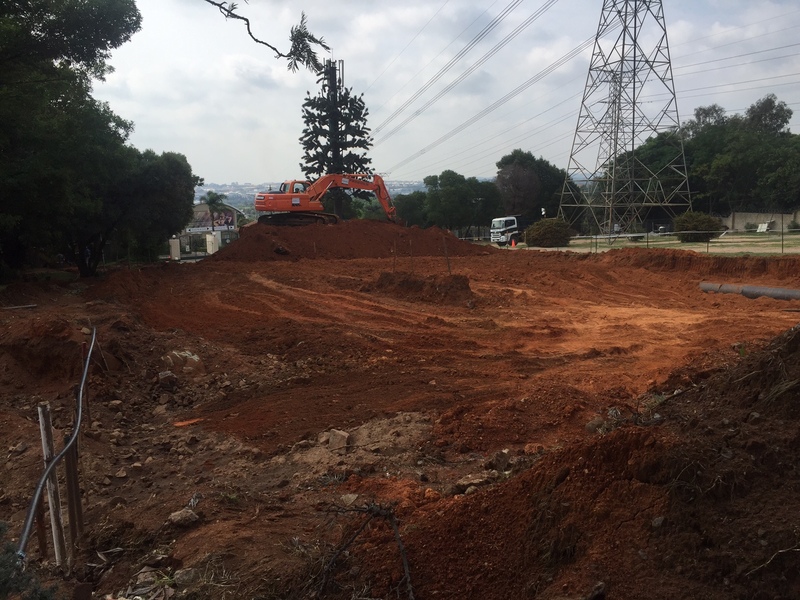 The construction of the left-in lanes from Middle Road into our two access points (Shul and Nursery School) will commence as soon as permission is received from Eskom to move their underground cables. We expect this to be within the next 10 days. The Main Synagogue and outside Brachah area is on schedule, with final “snagging” planned for May 2017. The building programme is progressing rapidly. 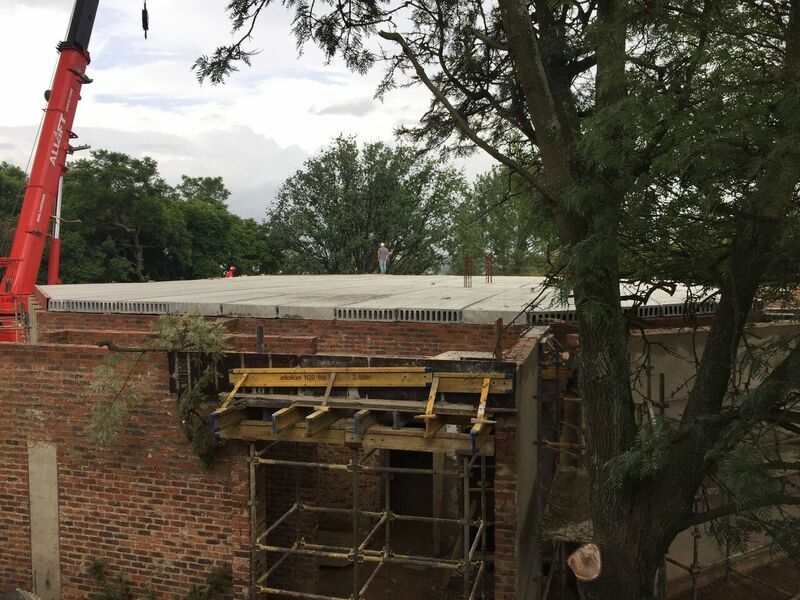 The critical milestone of the placement of the Echo Slab floor in the main shul building has been achieved. The next critical milestone is the placement of the roof structure. The Green Building Council of SA sets standards of excellence in environmentally friendly design, five stars being the highest level. In line with Tikun Olam, the electrical design for the new campus uses 1.5 watts per square metre to produce over 100 lux, which is line with a five star rating. The foundation stone will be in place for dedication at the Bet David AGM. The Nursery School is complete and fully operational, with final” snagging” on 15 February 2017 (Zone A). The Mitzvah School, Temporary Shul and Kitchen, Administration and other Offices are operational with final “snagging” on 22 February 2017 (Zone B). The Main Synagogue and outside B’rachah area is on schedule, with final “snagging” planned for the end of March 2017. 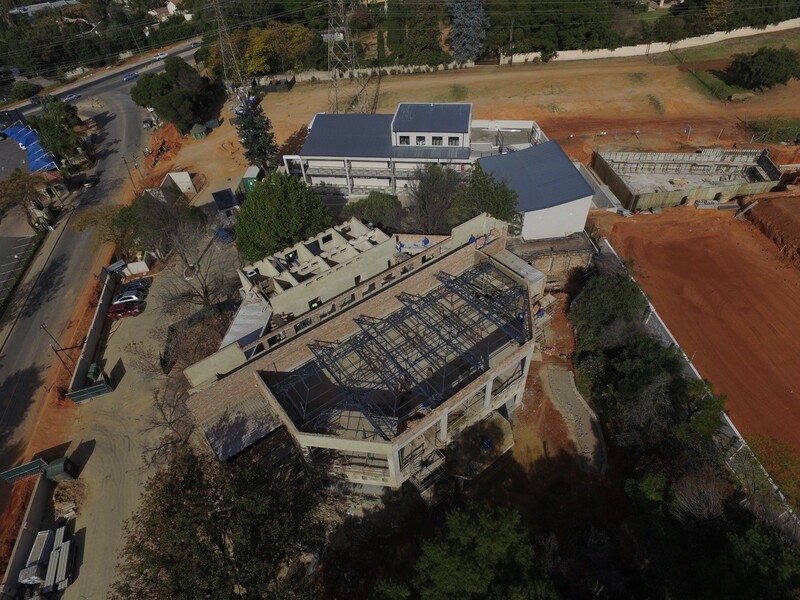 The building programme is on track for the move, by the end of September, of the Bet David Admin offices, the Mitzvah School and the Nursery School into Phase One of the new Bet David Campus. This phase incorporates the Temporary Synagogue. 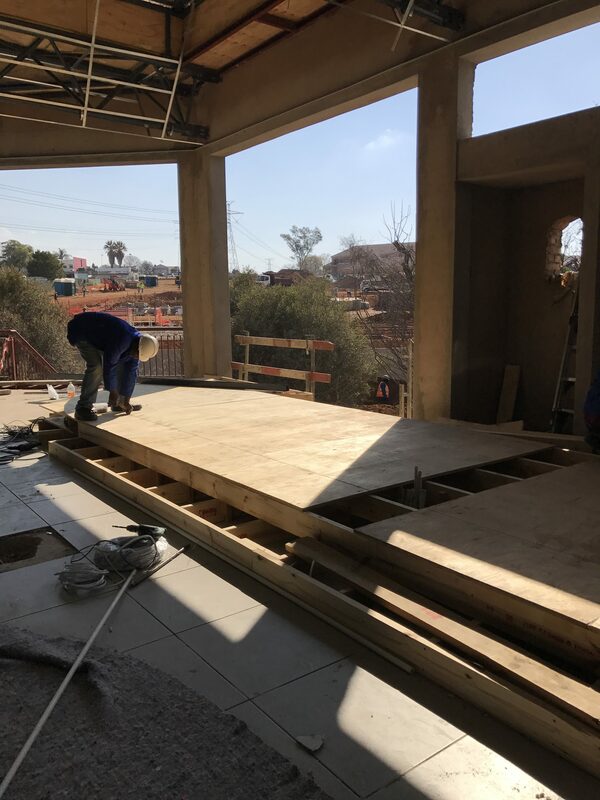 The rapid pace of construction is in accordance with our very ambitious building programme, thanks to our excellent Professional Team and Probuild, one of the highest rated construction companies in South Africa. The construction programme for Zone C has been hindered by delays in the delivery of specialized building components, such as the lift. 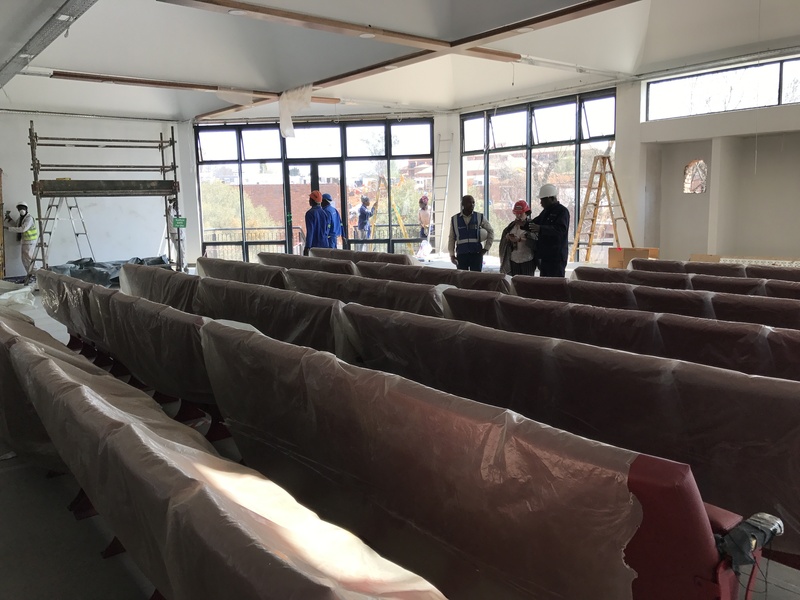 However, the programme has been adjusted so that construction can continue despite the delays and we can now look forward to moving into our beautiful new Synagogue at the beginning of March 2017. The specifications of the internal finishes for the new Synagogue have been finalized to complement the very special design of the Shul, which incorporates vaulted pyramids in the roof with sky lights. The process of moving over 35 mature trees and shrubs from the old campus to the new has begun and is being undertaken by specialists. The building program for our new campus is continuing at a rapid pace but the new Shul will not be ready for the High Holy Day services. These services will be conducted in the Hall of Crawford College, Benmore, Sandton. Please refer to the schedule HERE for service times and venues. Last weekend marked a milestone in the history of our congregation. In two moving and emotional services, the Bet David congregation bid farewell to the “old” Sanctuary and the Rondavel. During both services, many members were involved by Rabbi Schell in leading the congregation in prayers and the members of the Bet David Choir inspired the congregation with their beautiful music. The Erev Shabbat Family Service was made very special by the involvement of many children and the youth of our congregation led by Kendyll Jacobson, our Youth Worker. 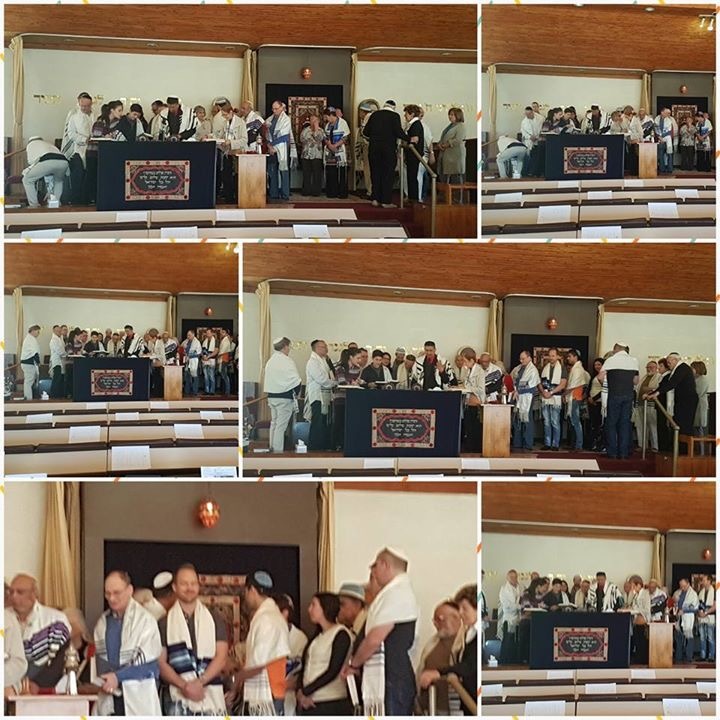 The highlight of the Shabbat Morning service was the Torah reading during which all congregants present were honoured with an Aliyah. Rabbi Schell used the opportunity to thank ManCom, Kehillah, the Choir, our teachers, the team of Gabba’ot, and Shamasim for their unending support and help in making Bet David a place of worship with a strong sense of community. “So proud of what you guys have achieved. Have a very special and historic weekend. Rhona and I thrilled to see that Bet David continues to thrive. All best wishes for the future as you move into your new home. Both the dinner on Friday evening and the bracha on Saturday were well attended and opened a space for congregants to share their memories of the old Shul. Bet David has been a place for happy moments, such as baby namings, brisses, bar and bat mitzvah celebrations, weddings and other celebrations, but also a place where people could find comfort in times of sadness, loss and mourning. None of these memories will be forgotten and the new campus will continue the strong traditions established over the last 43 years, which have become the trademark of Bet David: a warm, welcoming, and inclusive congregation that invites individuals and families of all observance levels to worship and learn with us. 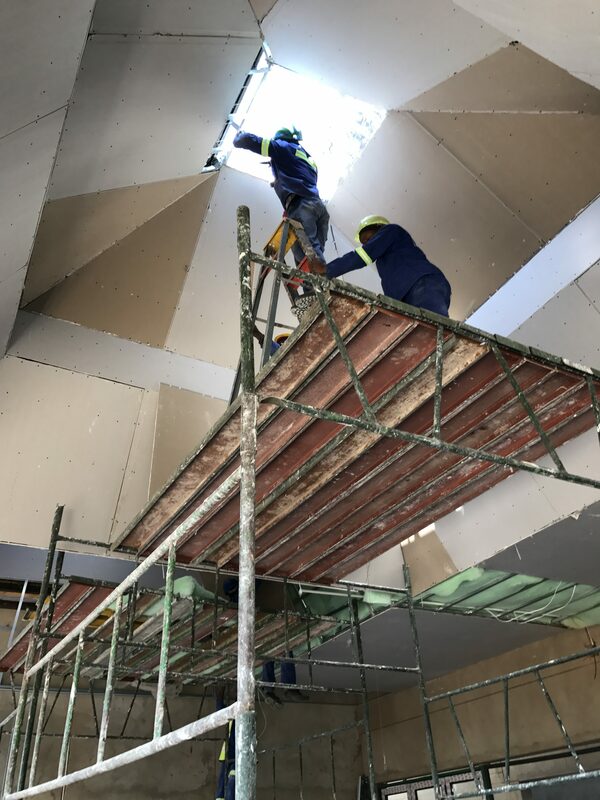 This week has seen the plastering of the walls and finishing of the floors on the ground level of Zone B, which houses the Mitzvah School, temporary Shul and temporary administration offices. 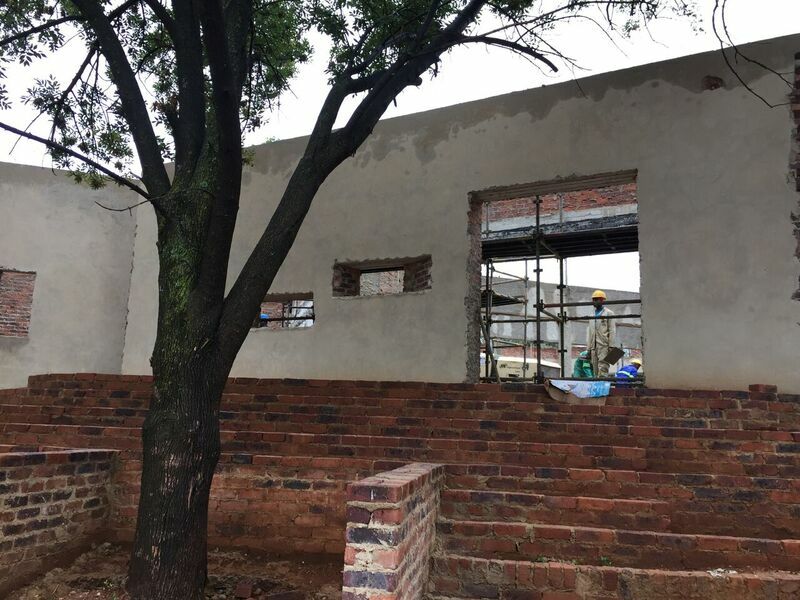 The roof structure is being erected on the Nursery School Block and staircases are being constructed on both blocks. After the special Shabbat Morning Deconsecration Service and the B’rachah this Saturday, groups of 5 to 10 congregants will be given a guided tour of the new campus construction site. Kindly advise Sharon at admin2@betdavid.org.za if you wish to participate. Hard hats and other safety gear will be provided. Please ensure that you wear suitable closed shoes. We look forward to sharing the weekend’s activities with you at Bet David. The new Bet David Campus is rising rapidly with the majority of the Nursery School (Zone A) and the Mitzvah School/Religion School/Kehilla/Youth block (Zone B) ground floor at roof height. 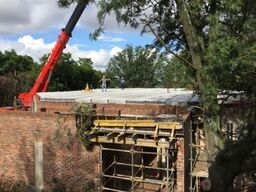 The eco slabs for the first floor of both these buildings will be put in place by crane in the second half of June. The sub surface storm water pipes and main water reticulation pipes have been laid. The excavation for the attenuation dam has been completed. 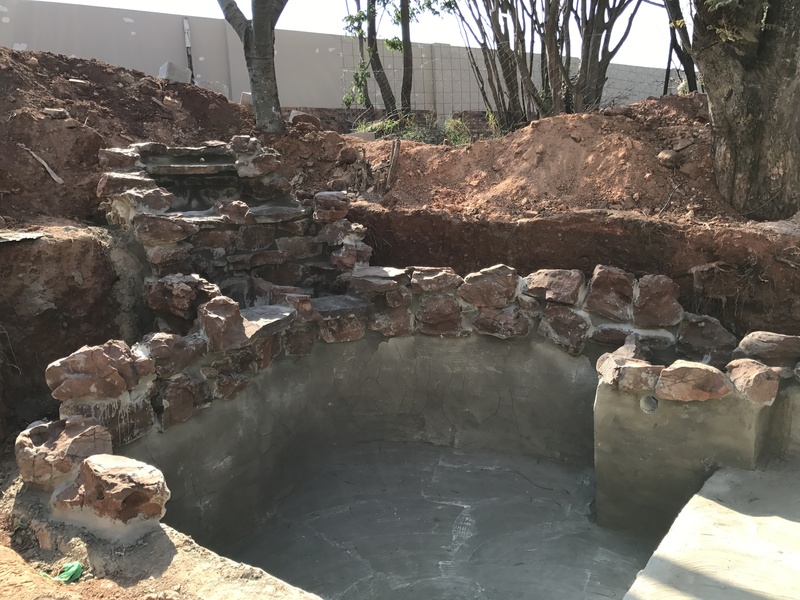 The large rock (mountain) under Zone B has been broken down and the pieces of rock have been put aside for the new water feature and stream. The paving for the parking area on the eastern side of the new Shul Block (Zone C) is 90% complete. Twelve percent of the construction programme has now been completed. The foundation for the Nursery was laid and as you can see from the pictures walls are already coming out of the ground. The Mitzvah School wing reached the first floor, and the pavement for the new parking area is nearly finished. The pictures from this week show Desmond Sweke and his team together with Rabbi Schell, explaining the next steps for the construction. As you can see, trenching is done around the existing trees to preserve them (3.3.2016). As seen in this photograph, Tuesday 9 February was a historic day with the groundbreaking for the new Bet David campus. The platforms for the new buildings are being cut this week. This has necessitated the change of entrance to Bet David to where the new entrance will be in the future. 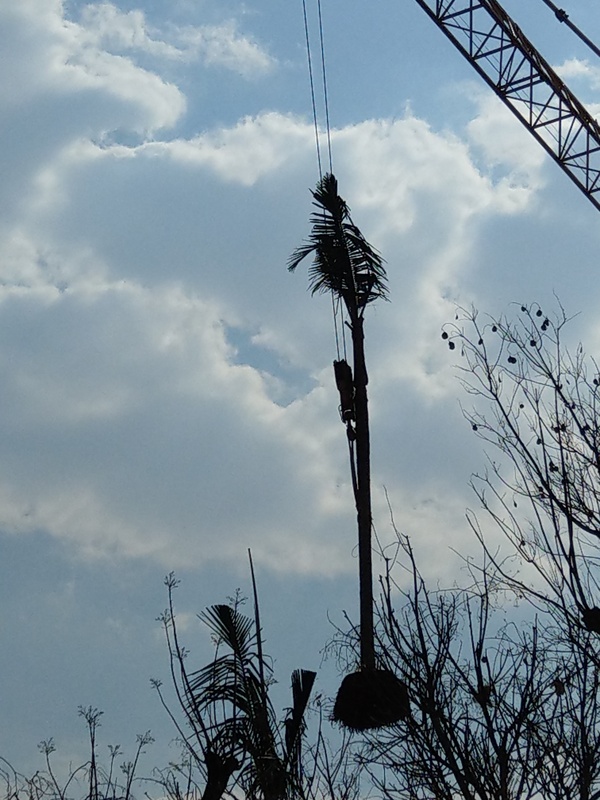 We are preserving as many of the existing trees and as much of the existing vegetation as possible. In the coming week, excavations will be made for engineering services and the storm water system. 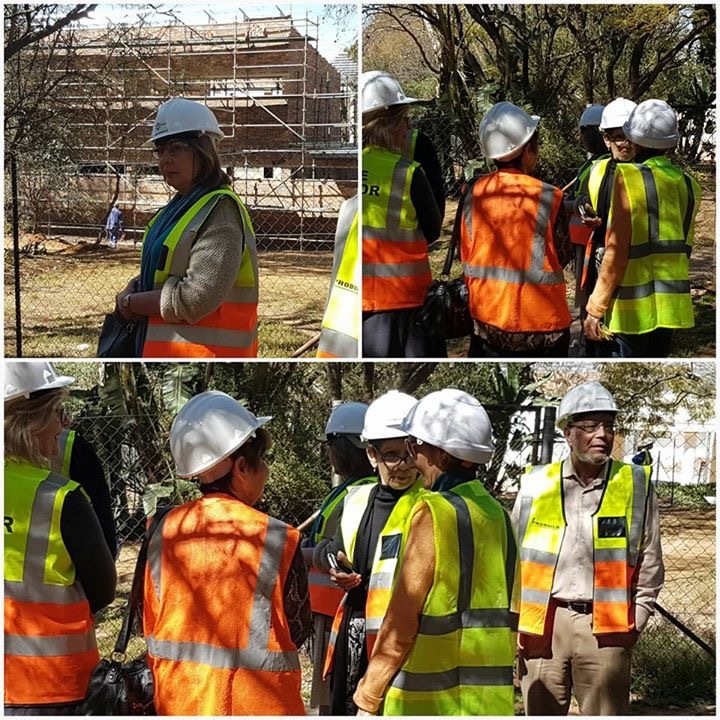 Due to the construction work on our campus and the current situation internationally and particularly in South Africa we updating our security protocol. Congregants are asked to please display their Bet David parking stickers on their windscreens. This will make it much easier for vehicles to enter the shul grounds and for the security guards to do their job. Those members who do not have parking stickers, should please make urgent arrangements with the office to get stickers. Exciting news! 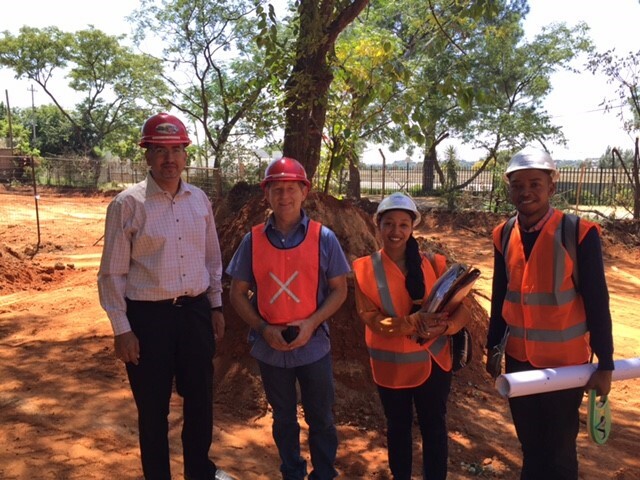 The construction for the site of our new Bet David campus is underway. Therefore, the entrance gate and driveway to the existing Bet David campus, Mitzvah School, and the Jolly Dee Nursery needs to move some metres to the South of the existing one. This is where the Rivers Parking entrance used to be. The change will take place this Friday 12 February. Congregants are asked to please display their Bet David parking stickers on their windscreens. This will make it much easier for vehicles to enter the shul grounds and for the security guards to do their job. Those members who do not have parking stickers, should please make urgent arrangements with the office to get stickers. Please also note that on Fridays Rivers Church has a service at 19h00 and there may be some delays as their congregants arrive at 18h00. Thanking you all for your co-operation. This is the first of regular updates to keep congregants informed of progress of the exciting development of the new Bet David Campus. This month, site establishment commences. The new Campus consists of three zones, namely the Nursery School (Zone A), the Mitzvah & Religion School and Kehillah & Netzer facilities (Zone B) and the Social Hall, Kitchen & Synagogue (Zone C). The appointed contractors, Probuild Construction, are undertaking the site establishment and in the week starting 25 January, earthworks will begin for the platforms for the Nursery School and the Mitzvah & Religion School. As the Mitzvah School will be located in the current driveway, just behind the existing Guard Hut, the entrance to Bet David will shortly be moved to the entrance used by Rivers Church. We are working with an arborist to protect the trees and shrubs during the construction process. To this end, a plant protection zone will be fenced off from the construction area and wood chips will be placed over root systems of vulnerable trees to protect them from compaction from construction vehicles. Investigations are currently underway to make the campus as water self-sufficient and as energy efficient as possible. This includes utilising rain water and our borehole. Those of you who have been at Bet David over the last few days might have seen that the first preliminary construction works have already started around the existing cell phone mast to make space for what will be later the new entrance of our campus. The coming weeks will be mainly dedicated to this kind of preliminary work, such as measuring, setting out the new entrance road, and organising the last steps before the construction work for the first buildings can start in January. In the meantime, with the support of Neebashnee Kristnasamy, we were able to kick off the first steps for the so called “soft move”. This includes cataloguing all the movable goods we have, and which need to find a new place in the new buildings.